I'm on holiday (or 'vacation') from uni at the moment, so have time to write some posts. I'm going to try to dedicate an hour each day to blog posting, and thought I'd examine various names from a statistical point of view, trying to identify what made the name popular in the past. I randomized the US top 1000, and ended up with Julia, so that is where I am starting. As a first post, this may end up being a little uneven, but hopefully I'll be able to communicate some interesting points. Some of my favourite blogs for names are Appellation Mountain and Legitimate Baby Names. My own approach of looking at individual names will focus more on their usage through time and space rather than meaning or bearers (though these will be brought in when appropriate, to illustrate various themes of use). Feminine form of Julius, possibly from Greek ιουλος/ioulos 'downy-bearded'. Roman usage: Was the nomen used by all female members of the gens Julia patrician family, so acted more as a family name or surname (though such distinctions aren't thoroughly accurate when dealing with Roman name forms) than a personal name. Famous branches of the gens Julia include the Julii Caesares and the Julio-Claudian dynasty, the Roman emperors. Ultimately the name Julia held a distinction that it was connected with the Roman emperors, and with the decline of Roman name forms (nomen, cognomen and praenomen) Julia was adopted as an independent first name. Julia was one of the members of the Roman church greeted by Paul at the end of his letter to the Romans (Romans 16:15), although she is not particularly singled out, this may have added later credence to the name as having a Christian origin, as well as a Roman origin. Julia's Roman location means it is difficult to judge whether Julia was her nomen or not, other names in the list such as Nereus, Olympas and Philologus are not, although this may be due to their Greek origin. Post-Roman and Medieval usage: Saint Julia of Corsica or Carthage was a 5th century Catholic saint. There is little reliable evidence about her life, so it is difficult to judge whether Julia was her nomen or whether she bore it as an independent name. However, the growth of her cult may have encouraged the use of Julia as an independent first name. There may have been a revival in her cult in the 8th century, when her relics were transferred to Brescia, a monastery on the pilgrimage route to Rome. Saint Julia of Mérida was a child martyr of the 4th century. Her cult seems to have been somewhat overshadowed by that of Eulalia of Mérida. Use of Julia, Giulia and Giulio seems to have been limited in Medieval Italy and Europe, though this is going by a small corpus of evidence. In England, Julia seems to have been overshadowed by Juliana and Julian (as a female name), possibly due to the popularity of the cult of Julian of Norwich, or Julian's name being indicative of a general trend towards the 'an' ending of the Juli- stem. Julian was #11 in G. Redmonds' top 20 for 1377-81 from poll tax returns. Renaissance and Reformation Use: It is again, difficult to tell the level of Julia's use during the Renaissance and Reformation, but it never seems to have been in the top tier of names - alongside Mary/Maria, Anne/Anna or Jane/Joan/Juana. Julia's position as a New Testament name, may have ensured its continued usage after the Reformation when non-Biblical saints' names seem to have declined. It at least held the credence of being an Italian name for William Shakespeare, who used it as the name of the beloved of Proteus in his 'Two Gentlemen of Verona'. Of course, the 'Juli' name more readily associated with Shakespeare is that of Juliet, in 'Romeo and Juliet', as well as 'Measure for Measure', which is set in Vienna, though most of the characters have Italian names (Claudio, Angelo etc.). There is also 'Julius Caesar'. The poet Robert Herrick wrote various poems addressed to a Julia in the 17th century, although they were not especially popular at the time. Julia seems to fit in the pattern of more classical names favoured by poets such as Ben Jonson (Celia), Richard Lovelace (Lucasta, Althea) and Thomas Carew (Celia again). Julia also appears in poems of this period by William Averell and a play by William Haughton (it may be notable that both these works employ Julia in a Welsh setting), as well as the play Love's Sacrifice by John Ford. Julia does not enter the top 20 in the data compiled by S. Smith-Bannister for 1550-1700, nor did appear in W. Camden's name list in his C17th Remains Concerning Britain. Overall, the picture of Julia in the C16-17th is that though it was heard of in England, it seems that this was in a more classical literary sense than as a name used on real people. Outside of England, there seems to be even less evidence for use of Julia, though it may have survived in Italy and Spain through continued awareness of the cults of St Julia. Use in 18th century: Julia appears in the 18th century as a literary figure once again, though there is evidence (possibly due to better record-keeping and survival) that by the end of the 18th century, Julia was becoming an accepted given name. Literary examples of Julia include Edward Lovibond's mid-century poem 'Julia's Printed Letter', Frances Brooke's 1763 novel 'The History of Lady Julia Mandeville', a minor character in Richard Brinsley Sheridan's 1775 play 'The Rivals', Robert Jephson's 1787 play 'Julia: Or the Italian Lover', Helen Maria Williams' 1790 novel 'Julia', George Colman's 1791 play 'Surrender of Calais', Miles Peter Andrews' 1795 play 'Mysteries of the Castle', William Beloe' 1798 poem 'Julia, or the last follies' and so on. Julia does begin to appear sporadically as a given name in this period in England and USA, though it is difficult to judge its spread of use due to lack of widespread record-keeping. There does seem to be an increase towards the end of the 18th century, and it is possible that the name Julia survived through continued family usage - this is anecdotal, but Sir George Shuckburgh married Julia Evelyn in 1757, his second wife, they then named their only child Julia, and Vincent Stuckey married his cousin Julia in 1801, and their daughter was named Julia. Founding Father Benjamin Rush also married a Julia (Stockton) and had a Julia amongst their 13 children. 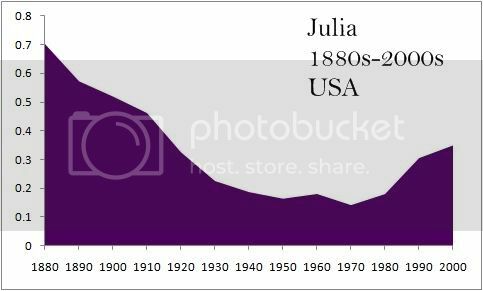 The 19th century is where we can begin to quantify the usage of Julia, especially in England (where I have gathered information), but also, towards the end of the century, in USA (post-1880). I'm including most of the USA data analysis in with the early 20th century post, as its easier to see trends stretching over 70 years than over 20 years. I'm going to focus away from the English-speaking countries for a little while now (unfortunately, most of my information, understanding etc. come from English-speaking sources so the analysis is a little one-sided). Anyway, looking at France for a moment now. The 'Juli' names especially associated with France are of course, Julie (and Julien). Indeed, it seems silly to examine Julia in respect to France, as Julie has always seemed to be dominant and fits in with the French theme of 'ie' names rather than 'ia' - Amélie rather than Amelia, Emilie rather than Emilia, Lucie rather than Lucia and so on. However, J. Besnard in La Cote des Prénoms claims that Julia as well as Julie was popular in the 19th century. My presumption with Julia, is that its use was both riding on the back of Julie - possibly in the parts of France that border Italy, such as Provence, as it is today, as well as being a result of the naming laws brought in on 1st April 1803/11 germinal XI in Napoleonic France that, as well as other laws, decreed that names that had not had previous usage within France could not be used, unless they were names of Greco-Roman antiquity or mythology, or certain foreign names, or fulfilled various other criteria. Julia may have had a boost from the vogue of Greco-Roman names such as Aristote, Socrate, Agrippine etc., as well as its plausible status as a foreign name, in a time when name choices were somewhat restricted and so originality had to be found by looking back into the past rather than combining pleasing sounds. A brief sojourn to Scandinavia is next. Swedish poetess Julia Nyberg, 1784-1856, was active in this period, though she published under the pen-name of Euphrosyne. I can't tell if her name was especially popular in Sweden at the time she was born, but lack of evidence makes me think it was not. There is the suggestion that children born near Christmas time may have been given a 'Juli' name due to jul being Yule or Christmas in Norse. Nyberg, however, was born in November so a Christmas meaning is perhaps stretching it a little, though it may be associated with a Christmastime baptism. In Norway, in the 1880s - where records seem to begin, Julia seems to have been rare, with Julie having (and still having today) more of a presence. I'll have a little focus on USA before switching back to England. Though it is difficult to assess the popularity of Julia prior to 1880 and the beginning of the SSA records, when it entered at #26 and then fell in rank for the rest of the 1800s. This was Julia's highest ever ranking, and it is possible to presume that Julia was even more popular in the mid 19th century. A few notable Julia's emerge in this century - Julia Ward Howe, born 1819 (and the daughter of a Julia), wrote the 'Battle Hymn of the Republic', Julia Dent Grant, born 1826, was the wife of US President and Union commander Ulysses S Grant, and Julia Gardiner, born 1820, was the wife of US President John Tyler. The first two have especial links with the Union during the Civil War, and it may be interesting to see if that had any effect on regional naming practices. Julia Tyler supported the Confederates, but she seems to have been more out of the public eye by the Civil War. Okay, now to England and exciting things like charts and stats. Julia is the 40th most popular name in the 1881 census, as calculated by K. Tucker. As I mentioned in my previous post comparing the census and my own data, it can provide a snapshot of names looking back to before Birth, Marriage and Death records began in 1837. However, I have found that trying to compile name popularities from census records is difficult. Principally, the databases that hold such information are rather unwieldy with their counts, and it becomes rather time-consuming trying to ensure that such counts include only people with the first name of say 'Mary' rather than those with Mary somewhere in their name. Anyway, K. Tucker places Julia as 40th, with 56, 621 individuals with that name alive in England in 1881. This may seem impressive, but compared with Mary's 1, 870, 086 individuals, Julia is rather small fry, comprising just over 0.4% of the female population. My own data is based on birth data, so produces information similar to what is released by governments, what names were given in a certain period of time, rather than what names were popular throughout the population (as census data shows). For ease of gathering information, I collected information of everyone with the surname Smith and looked at 5 year groups of information (eg Mar 1840-Dec 1844, Mar 1845-Dec 1849 and so on). To counteract the problems associated with population increase, the names were ranked in order of popularity (eg #1, 2 etc.) and these are the numbers down the left hand side of the graph, so Julia begins in 1840-4 as #32, rises to #29 in 1844-9 and so on . Julia starts off popular, but declines throughout the century, until it is almost unknown by 1900-5, with just 37 births. Julia is never wildly popular, but does seem to be visible throughout the period, especially 1840-55. This seems to correlate with the number of notable Julia in England I've noted for this period. These are the Julias who appear in the Oxford Dictionary of National Biography born between 1800-1900. A side note about famous bearers from the 19th century. It is notable that Julia is barely used among European royalty in this period. Alexander of Hesse and by Rhine married Julia Hauke in 1851, she was the daughter of a Germano-Polish general, but was not considered of sufficient rank for any of her children to qualify for succession to the Hesse and by Rhine throne. However, her children did marry into major European royal families, include her son Henry marrying Princess Beatrice of England, and from this marriage came the later queen of Spain - Victoria Eugenie Julia Ena, and her son Louis marrying Princess Victoria of Hesse and by Rhine, a granddaughter of Queen Victoria, and bore Victoria Alice Elizabeth Julia Marie, who later married Prince Andrew of Greece and was the mother of Prince Philip, Duke of Edinburgh. In all the cases of Julia's grandchildren and so on, her name was not used as a first name, rather tucked among the various honouring names - possibly showing that Julia was not royal enough to be honoured among the first names. Let's start with the USA, principally because there is good info available, also because my English data has a gap from 1910-44. A more detailed breakdown can be found on the NameVoyager, the above graph takes the % of births for each of the decades (on left/y axis). So Julia begins in the US comprising about 0.7% of births, at a position of #26, it then falls and is now resurging steadily in the 2000s. This graph also demonstrates how the % of babies named with the top names has decreased. In the early 2000s, Julia was at a similar chart position as it was in the 1880s - in the 30s. But the number of births in the 2000s comprises nearly 1/2 that of in the 1880s. Julia is now falling again, after such a peak in the early 2000s, and was #50 in 2008. I've explained the early 1880s peak in the previous section. 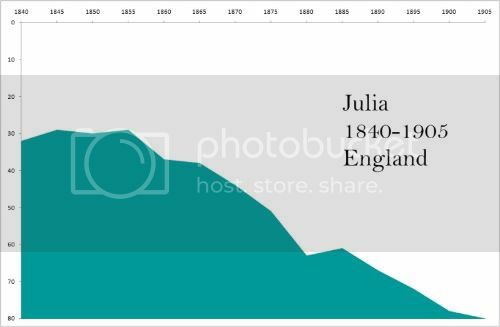 The decline (though Julia never fell out of the top 150) can be considered both a consequence of previous popularity (becoming a 'grandmother' name), and the growth in popularity of Julie, which has an almost opposite popularity curve to Julia - not very popular in 1800s, peaking quite dramatically in the 1960s, and declining quickly. Julia's resurgence may be seen as it shaking off the 'grandmother' image - it begins to rise around 100 years after the peak in 1880, as well as a response to the popularity of Julie. My presumption is that Julia also received a boost from the Hispanic population, however, I am not certain whether that is correct. Today, Julia's highest popularity is in New England - #9 in Connecticut (it was #2 there in 2001), #12 in Massachusetts, not in the south-western heavily Hispanic populated states of New Mexico and California. This trend is evident from the late 1990s, and seems that Julia may have more of a 'WASPy' feel to it than Hispanic. From the 1960s to mid-1980s however, it was more popular in the mid-western coastal states moving into the mid-west, as well as the south-east, with no particular emphasis in the more heavily populated 'Hispanic' states. While Julia has maintained a presence in these states, it is much more popular in the North-east (it should be noted that Julie was never especially popular in the north-east, its popularity seems to have emanated and centred in the north-west). Famous American Julias have included cook Julia Child (1912-2004), comedian Julia Louis-Dreyfus (b.1961), actress Julia Roberts (b.1967) and actress Julia Stiles (b.1981). Let's go to France next. I don't really have much to say about France, principally because Julie rules supreme there (was #1 for a year in 1987), and it seems a little silly to be talking about Julia. Still, as mentioned before, Julia is not unheard of in France. J. Besnard informs me that 1 girl in 400 is now named Julia - about the same as Chiara, Anna and Emilie. You can get a nice little graph for Julia on prénoms.com, which is somewhat similar in shape to the US graph, except that Julia is now peaking at more than was found previously, rising in the 1980s, and then more rapidly in the 2000s. 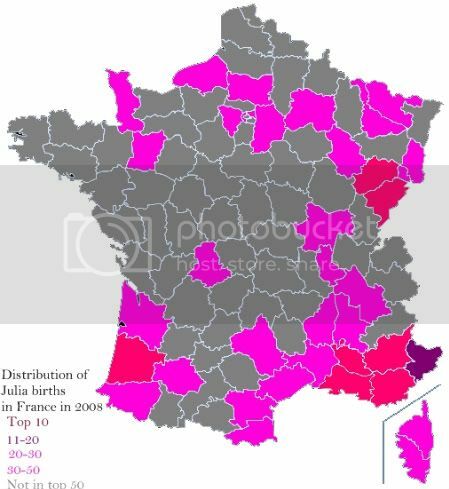 Prénoms.com provides a list of Julia's popularity in each département, but it is number of births and isn't very useful as it doesn't take into account relative population size. Instead, I've gone through their top 50s for each département and recorded where Julia is in the top 50. The pink you see on most of the map is for ranking between #30-50, the dark purple in the right hand corner is because Julia is in the top 10-20. As you can see, Julia in France is defined by the borders or coasts - most popular on the border with Italy, Spain and Germany/Belgium - all areas where Julia is popular. Julia is less popular in the central regions, where I presume there is less cultural contact with regions where Julia is both linguistically acceptable and popular. Onto Germany. I'm going to examine the graph and distribution map from beliebte-vornamen.de, which doesn't provide a complete sample but does seem to at least give an indication of trends and styles that seem fairly accurate (my knowledge of general German name trends prior to 2000s is fairly limited), and is very helpful considering that the Germans don't provide official statistics. Julia was #1 or in the top 10 in Germany between about 1977 and 2000, and has since tapered off in popularity. It was fairly unknown in Germany prior to the 1940s. Such a peak coincides with that in the USA and France, although the popularity in Germany was much higher. It seems to be particularly popular in northern and western Germany, possibly due to the popularity of Julia in Scandinavia, especially Sweden. That makes a nice move into Sweden, which is another place where Julia has been exceptionally popular in recent years. Julia was #7 there in 2009, and in 2001 it was #1. It has flitted around the top 10, but is possibly now declining, which fits in with the general trend of this name. Looking at the rest of Scandinavia, Julie is more popular than Julia in Norway, though Julia is just in the top 50 and peaking in popularity. In Denmark, Julie is also in the top 20, with Julia absent from the top 50. In Iceland, Júlia is #10 of the names given to girls 0-4 years, but is absent from the top 100 of the population, so appears to be a recent import. Looking around the rest of Europe, Julia is also popular in Austria, where it was #6 in 2008, Poland, where it was apparently #1 in 2009, Hungary, where Júlia was #50 in 2008. In Spain, Julia is most popular among the whole population in the mid-western area of Castilla y Léon, Extramadura, Madrid, Castilla la Mancha, and in the north-east in Catalonia. In the 2000s, its highest popularity is in Catalonia in the north-east. In the Netherlands, Julia was #3 in 2009. In Ireland, Julia was #34 in 2008. Julie is more popular in Belgium (#5 in 2008). Giulia was #1 in Italy in 2008. I'll finish Europe off with the UK . My data is primarily for England and Wales, this graph shows from 1944-2008. I have information for every 10 years from 1944-94, and then every year from 2003-8. Like my previous UK data, this graph shows ranks rather than % of population with such a name. Julia is steadily in the bottom half of the top 100 from 1944-74, it then drops out of the top 100, only reappearing in 2007, and climbing slightly in 2008. It will be interesting to see if Julia climbs any more in 2009. Julia is much more peripheral in the 20th century than in the 19th. It also interesting that it does not follow the same trend in England and Wales as it does elsewhere such as USA and Germany - rising in popularity in the 1980s, and now beginning to decline. Julia is not a name that figures highly among the names favoured by those who post their birth announcements in the Daily Telegraph in 2008. From my data collection, I found that Julia came in at #100 with 3 girls given that first name (among several other 3 births including Claudia, Francesca, Gabriella, Katherine, Tallulah and Victoria). While it did have a presence, the position in the Telegraph names is broadly close to its position in the England and Wales national statistics, and does not have a big change, unlike say Alice, which was #46 in the national charts in 2008, but #2 in the Telegraph lists. Julia was #79 in Scotland in 2009, falling by 10 from 2008, and #69 in Northern Ireland, rising from #97. Across to the Americas. Apparently Julia was #3 in Brazil - though familyberry don't give their sources so I'm always somewhat sceptical, possibly #6 in Uruguay. Julia appears in the top 50 in various Canadian provinces. I think the general trend is popular in Germanic-speaking countries, fairly popular in Romance-speaking countries, and not really that popular in English-speaking countries. Yuliya is popular in Russia, and Yulia in Ukraine, and Giulia in Italy. I included these stats as I think they are close enough to Julia to make an impact (but did not include Julie names). So how would I define Julia? In Roman times - a regal family name, in medieval times - cultic and Christian, in Renaissance to 19th century - literary, surviving on real people as a family name, in the 19th century, being adopted as a first name in English-speaking countries but not by royalty, and in the 20th century we can see its international spread and current popularity. Errant medievalist, who knits, crochets, bakes, photographs and sometimes posts to her blog.